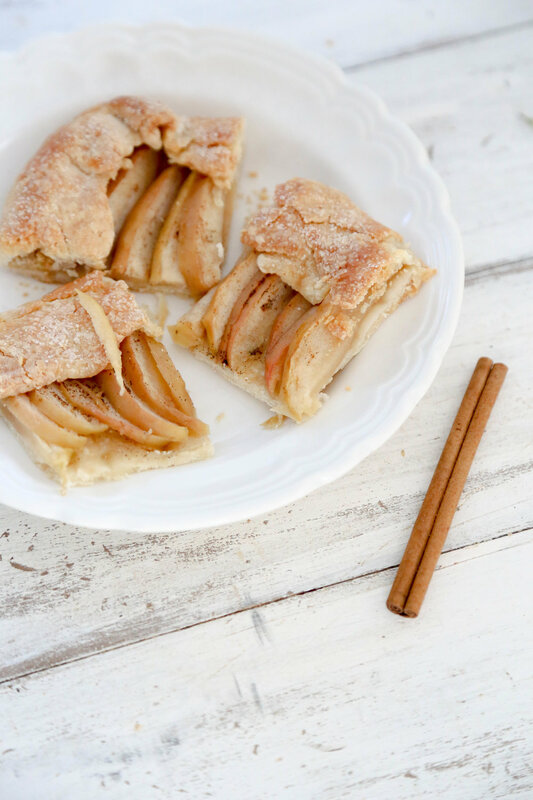 Fall Cocktail Party: Apple Tart & Roasted Snacks — urban. apron. I recently got together with three other St. Louis bloggers who are as inspiring as they are talented & beautiful. [Check out their stellar blogs: My Lavender Blues, Delish Knowledge, and Feed Me With Amanda!!] I'm truly blessed to call them friends. These are women who talk about food, celebrate food and recognize food's profound influence on us all. Oh, and they all make reeeeally delicious food. 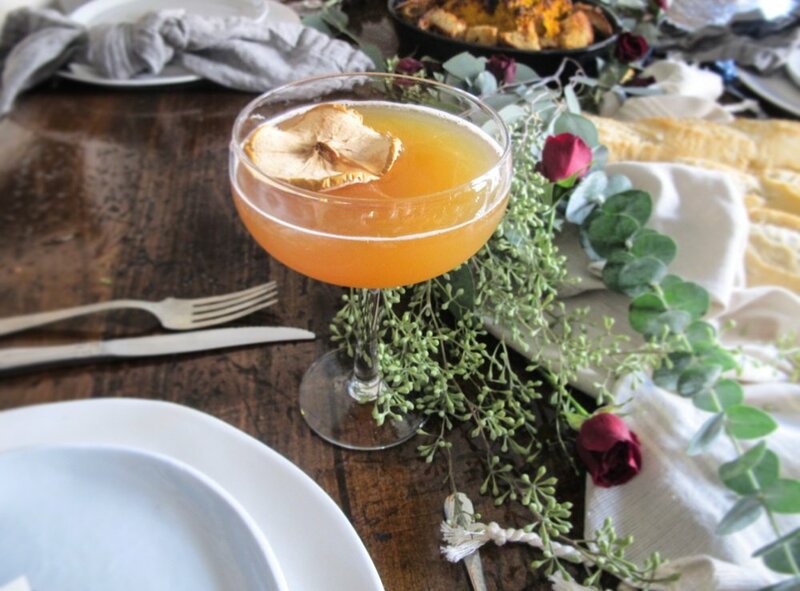 For our Autumn cocktail party, we each made a dish and got together on a fall afternoon. And most importantly - snacks galore! Julia made a beautiful roasted cauliflower for a stand-out centerpiece. A wheel of Brie topped with roasted grapes and pears (oomgoshhh, so good!) made by Alex. For dessert, Amanda made a fig-layered, chai-spiced cake and I brought a rustic apple tart. The food was topped off with Alex's Ginger Snap Cocktail. Now that, my friends, is a fall feast! Below is the recipe for my apple tart. I first made this tart for a dinner party a few years ago, inspired from a recipe I read in Bon Appetit Magazine. Ever since, it's been my go-to apple tart. Make Tart Dough: Whisk flour, sugar and salt in a bowl. Add the cubed butter and rub the butter in with your fingers, or cut up with a fork, until mixture resembles a coarse meal with a few pieces remaining. Drizzle the beaten egg over the butter/flour mixture and mix gently with a fork until the dough comes together. Turn out dough onto a lightly floured surface and knead until smooth. Form the dough into a disk. Wrap dough in plastic and chill - at least 1-2 hours. Make the browned butter: Place the 1/2 stick of butter in a small saucepan. Split the vanilla bean lengthwise and scrape in vanilla seeds; then add the entire vanilla pod to the pan. Cook over medium heat, stirring often, until butter foams, then browns (be careful not to burn! ), about 5–8 minutes. Remove pan from heat right as it turns golden brown. Remove the vanilla pod. Make Tart: Roll out the dough on a lightly floured surface into a large rectangle, about ⅛” thick (you can also roll it onto a round shape). Transfer to a parchment-lined baking sheet. Arrange the apples on top, overlapping them. Make sure to leave around 2" border. Brush the sliced apples with the browned vanilla butter. Then sprinkle the top with the dark brown sugar. Lift edges of the dough over the apples, keeping the rectangle shape. Brush with egg wash: Beat the egg with 1 tsp. water in a small bowl and brush the crust with egg wash. Sprinkle with raw sugar. You can also use white sugar. Bake the tart until apples are soft and crust is golden brown, about 45-50 minutes. Rotate sheets halfway through baking. Let cool slightly on a baking sheet before slicing. Place foil around the tart if the crust is browning too quickly as you bake it. 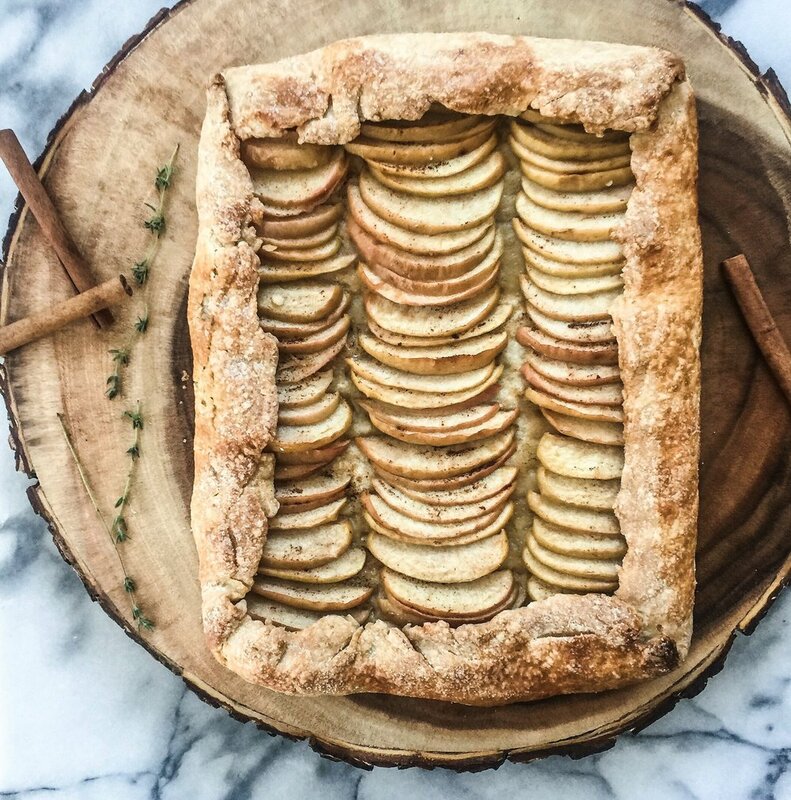 NOTE: You can make this apple tart up to 2 days ahead. The tart dough can be made up to 2 days ahead or it can be frozen for 1 month. If you have extra tart dough, just store it in the freezer for a mini tart later on. Some snacks I love to make when I entertain are roasted nuts and chickpeas. Below are the two I brought to our fall bash. There is something effortless about roasting nuts and serving them in small bowls across tables, easy for nibbling. Line a sheet pan with 3 layers of paper towels. Spread the drained chickpeas on the paper towels and dry. Let sit for at least 3 hours and up to overnight. Transfer the dried chickpeas to a medium-size bowl. Add just enough olive oil to coat and toss. Add the rest of the ingredients and toss to coat evenly. Taste and add more spices, if desired. I sometimes throw in ground Turmeric too. Throw away the towels and spray the baking sheet with non-stick spray, then spread the chickpeas on the pan in a single, even layer. Bake until the chickpeas are golden and super crispy, about 30 to 40 minutes, tossing halfway through. Let cool completely before serving. I store extras in an airtight container for a few days. To serve, I top the bowl of chickpeas with chopped, fresh oregano for color and flavor! My rosemary plant is flourishing right now so I use fresh rosemary in these roasted nuts. But, dried rosemary will work just fine. There are perfect for a fall party! In a medium bowl, whisk the egg white and salt until foamy. Add the maple syrup, rosemary and cayenne pepper. Stir in the nuts and toss until completely coated. Spread the nut mixture on the prepared baking sheet in a single layer. Then sprinkle the finished nuts with extra fresh rosemary, if desired.. 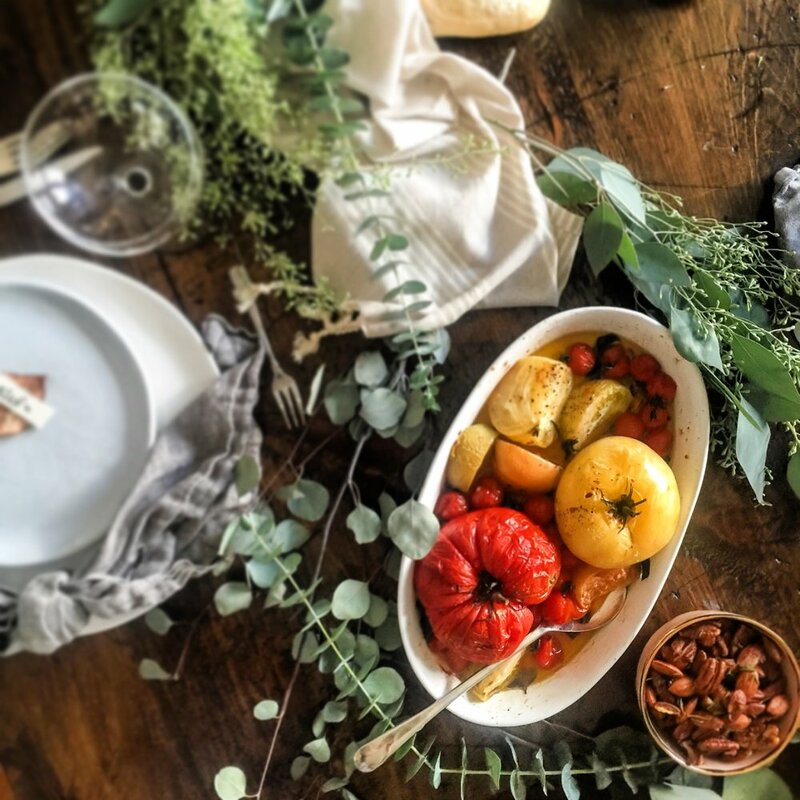 I hope this inspires you to host your own fall party! This idea can work for anyone. Pick a date. Pick a theme. Have everyone bring a dish. Someone do the cocktail. Someone make the main dish. Someone bring the apps. Someone in charge of dessert. And be sure to share the recipes with each other when it's all done! I hope your own get together will be as magical as our fall afternoon. Because when you gather people around a table - that's when the magic happens. Not everyone likes sports. Not everyone runs or paints. Not everyone grew up in the same city or country... But, we all eat. Eating is what holds us all together. Let's celebrate it! Below is the menu we served at our Autumn feast. Just click on the dish and it'll link you to the recipe! And surrounding yourself with good people who inspire you to be better in so many ways.